Why? That’s a dang good question….. This year, I will __________________(fill in the blank). The idea of making “resolutions” isn’t a new practice, but can actually be traced back some 4,000 years ago to the ancient Babylonians when they made resolutions to their gods to repay debts and return any borrowed objects. This was done in the hope of favor for plentiful crops and food supply. Today, roughly 40% of the population still keeps the practice of making resolutions every year, and although we all want plentiful crops, most of the resolutions made in this day and age include some sort of self-improvement. For as long as I can remember, my resolutions(s) have consisted (in some form or fashion) of less food, more exercise, more organization, becoming a better person, and an overall “I’m going to get more healthy” campaign. And…like clockwork, as it nears midnight and I am watching the ball fall in Times Square (while taking my last bite of Butterfinger), I find myself making BIG plans with good intentions that seem to kerplunk somewhere during the year. Over the years, some resolutions have been more “successful” than others, meaning I “stayed” the course longer than the statistics predict, but the overall result was the same: change for a time and then reversion back to old habits. Why has permanent change in some areas been so difficult for me? Am I not strong enough? Am I not committed enough? What is my deal?! When I decided to author this blog topic, it became a perfect time for me to dig in and do some real, raw, and unrestricted self-reflection. OUCH!!! So, I’m taking Mr. Ford’s advice and I’m adding a twist. I made a different kind of resolution this year. I made only one resolution for 2017: #365daysofthankful. You know what? Only having ONE resolution has been REFRESHING and LIBERATING! It’s been interesting to watch myself experience how this one and only resolution has me approaching my same ol’ situations as before, but producing different results..
Have you ever felt that true, down-to-the core gratitude for something? When you feel this overwhelming feeling for something, one automatically wants to take better care of it and make a concerted effort to ensure it’s a priority. Instead of making my STANDARD list of resolutions for each of these: mind (self improvement), body (weight), and time (organization), I am hoping they reap the rewards as a byproduct of #365daysofthankful… all on their own. The power of gratitude is truly incredible. I am really looking forward to the first year of my life when I made just one resolution. 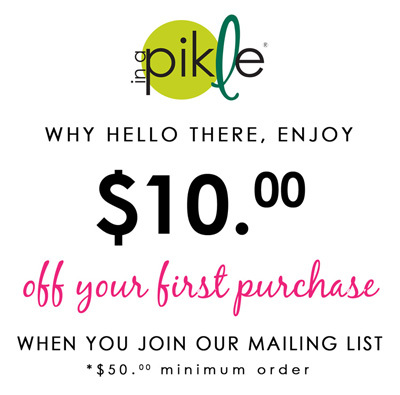 BUT…For those of you that made a “get more organized” resolution… let “In A Pikle” help! We have the perfect solution to those daily dilemmas. And…we have a great Bundle sale happening this month that you DO NOT want to miss! Click here to shop: https://www.inapikle.com/product-category/bundle-up-sale/! This entry was posted in In A Pikle and tagged 365, resolution, thankful.